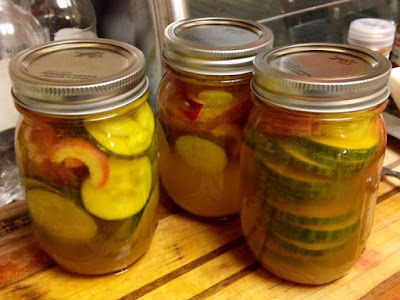 happily intended: Hooray for the Quick Pickle! Hooray for the Quick Pickle! When reading a restaurant menu, few things light up my face quite like the words, "house-made pickles." Bonus points if we're talking pickled red onions. And yet, I had never thought to make them myself, despite seeing quick pickle recipes all over the place. As you can see above, today I broke through into the hipster- and prepper-filled world of home canning. I made some quick-pickled cukes, red onions, and garlic using this recipe from 'The Chew.' Turns out the push I needed was an endorsement from my TV-chef-fake-boyfriend Michael Symon. It probably doesn't hurt that he was serving them atop a hot dog, one of my favorite, favorite foods and guilty pleasures. This recipe has a really high ratio of satisfaction to effort--a little chopping, a little mixing, a little pouring, and you're done! The result is a beautiful, fragrant jar of your very own house-made (or, in my case, apartment-made) pickles--minus the noisy gastropub!